I don’t post a lot of salads. I think it’s probably because I don’t make salads at home very often. I do eat salads out at restaurants fairly frequently though, and my three favorite ones to get are a nut-crusted goat cheese salad (much like the one I re-created here), a Pittsburgh Steak Salad with warm Riviera dressing (I am desperately trying to figure out how to make this dressing…when I do, you will know) and Chicken Souvlaki Salad. Buffalo has a lot of Greek restaurants, and even local restaurants that aren’t primarily Greek often have a Chicken Souvlaki Salad on the menu. If you love Feta cheese even a fraction as much as I do, you’re going to love this salad. The tangy Greek vinaigrette I adapted from allrecipes is absolutely delicious. It’s probably the best Greek dressing I’ve ever had. This is definitely an entrée-sized salad, and I found it to be really filling for lunch or dinner. It’s even easy to make the dressing and chicken ahead of time and bring all the components to work for fresh, tasty lunch. I prefer the chicken to be warm when I serve it so I recommend microwaving it for leftovers, but I’m sure it tastes great cold as well. I personally don’t like peppers and onions very much but many restaurants also include those or olives on their souvlaki salads, so any of those would be great add-ins as well (not included in my nutrition calculations below). 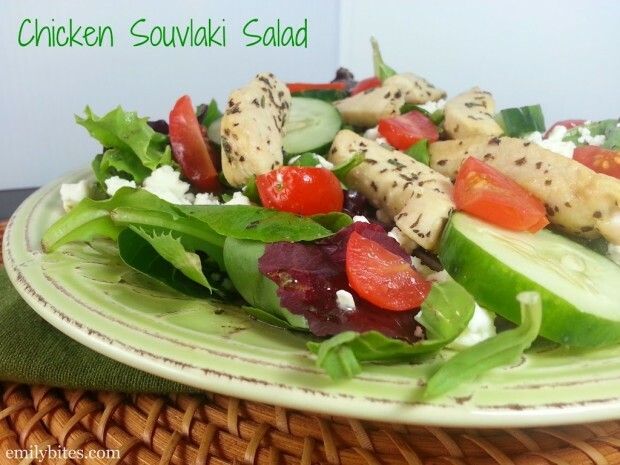 If you’ve never had a Chicken Souvlaki Salad before, I highly recommend you try this one – you won’t regret it! Dressing Instructions: Combine all ingredients in a medium bowl and whisk until combined. Pour into a sealable Tupperware container or Good Seasons bottle. Shake well before using – dressing will separate in between uses. In a large skillet, bring the oil over medium high heat. Add the garlic, basil, oregano and rosemary and stir into oil. Cook for about a minute until garlic is fragrant. Add the chicken to the pan and stir to coat chicken with the oil and herbs. Cook for 5-7 minutes until chicken is cooked completely through. Spread 3 oz of lettuce on each plate and top each with 2 tablespoons of dressing (don’t forget to shake the dressing well in its sealed container before using). Evenly divide the cucumber slices and tomatoes between plates. 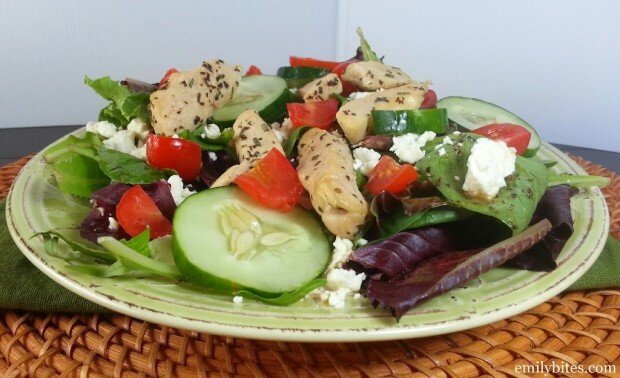 Sprinkle each salad with 3 tablespoons of Feta cheese and 2 oz of chicken. Awesome! That Allrecipes dressing is the same one that I base mine on! I love the chicken preparation here. I’m in a tiny condo without a grill, so this will be a great way to get the herbs infused into the chicken without having to marinate forever.